This exquisite finely detailed medium Luckenbooth is superbly made. The design is amazing given its small scale. 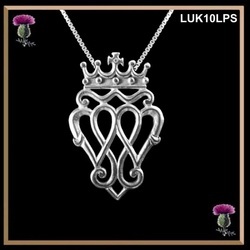 There are three intertwined hearts for love and a crown for Mary Queen of Scots representing loyalty to Scotland. This design is available in sterling silver and karat gold and a variety of simulated traditional stones. The three stones used in Scotland were local stones. Amethyst, Cairngorm (the name for Citrine in Scotland) and Garnet. This Queen Mary Luckenbooth measures 33mm (1-1/16") X 21mm (13/16"). The stones is 8mm in diameter. In Karat gold the chain is not included. This is a gorgeous piece of Scottish jewellery that will become your family heirloom. This beautiful traditional pendant and includes a high quality 18" box link chain. 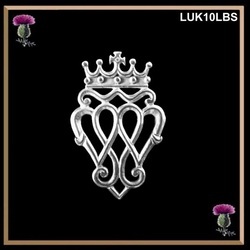 33MM (1-1/16") X 21MM (13/16") and includes a high quality 18" box link chain. 33MM (1-1/16") X 21MM (13/16") .